A traffic counter inside the building, positioned so that people paying fines do not have to go through weapons screening in order to pay tickets. Electronic signage listing all departments and calendars for the day. Child support calculator in the self-help clinic and available to the public. A grant-funded child waiting room (operational in 2018). Escalators connecting the first through third floors. Civil and Criminal Clerks Offices with a numerical system to notify patrons of their turn at a specific window. Courtrooms with one or two attorney-client conference rooms each. Attorneys' convenience room with electronic device charging stations and a child support calculator. Secure rooms for attorneys to meet with in-custody defendants. Elevators for in-custody defendants are separate from general use elevators and go from the holding cell to the department of holding cell on that particular floor. Questions have arisen about weapons screening. All staff, public and attorneys will go through weapons screening. Attorneys with a current bar card and a current picture ID will not be required to remove their belts. During peak hours, staff and attorneys will have an expedited line. Please note that the State Bar has stopped automatically sending Bar Cards to members. However, attorneys may order and/or download a paper copy from the State Bar's website. James M. Morris is an attorney with Downey Brand and is married to Judge Robin Appel. Contcat Jim at . 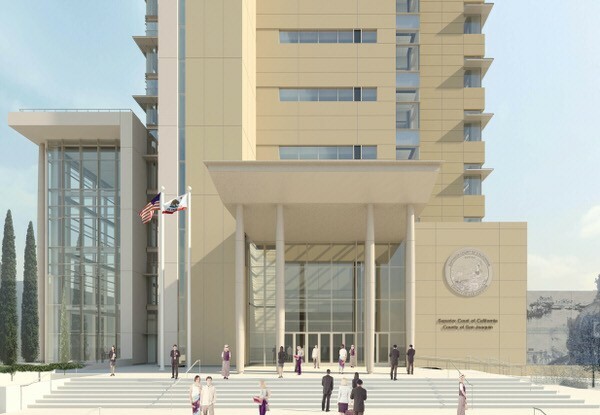 Thursday, 15 June 2017 Stockton's New Courthouse: It's Really Happening!